The nuns suffered injuries in an attack against the Little Flower Higher Secondary School in Chinnasalem. Hindu extremists tried to strangle them with Rosary beads. Bishop Mascarenhas asks "What is this country coming to?" New Delhi (AsiaNews) – The "four nuns wounded in the attack by Hindu radicals were discharged from hospital and are back in the convent,” said Sister Devaseer Mary, provincial superior of the Franciscan Sisters of the Immaculate Heart of Mary, speaking to AsiaNews. 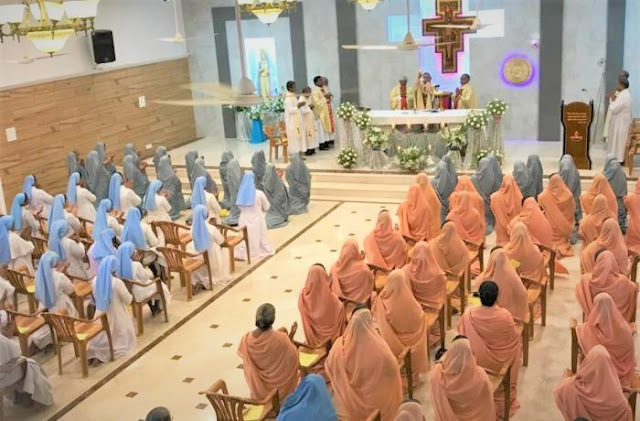 The nuns in question were the victims of a vicious attack in Tamil Nadu by a crowd of 200 members of the extreme right-wing Hindu nationalist Rashtriya Swayamsevak Sangh (RSS), who tried to strangle them with the rosary beads they wore around their necks. The attack against the Little Flower Higher Secondary School in Chinnasalem, a Catholic educational facility located some 260 kilometres south-west of Chennai (Madras), took place on 26 March. The school is run by the congregation to which the superior belongs and was founded 74 years ago to educate children of poor families. Presently, some 2,150 students are enrolled. The building was devastated: classrooms, desks, windows, auditoriums. The attackers did not spare the chapel. The attack was apparently a reaction to the suicide of a 10th grade student who was disappointed by her poor exam results. According to Mgr Theodore Mascharenhas, general secretary of the Catholic Bishops' Conference of India (CBCI), the incident "has nothing to do with money" since the nuns had already decided to help the student’s family before the desecration. "For us, this attack is a very sad thing. The whole school was mourning the death of the girl. We love our pupils as if they were our children,” the prelate said. "If it were just a question of money, they would not have desecrated the Crucifix. Even the attempt to strangle the sisters with their Cross, is a contempt of faith." Sadly, "Sisters strangled with the Crucifix? What is this country coming to?" “In Indian culture sacred objects are sacred for everyone, regardless of religion,” Mgr Mascarenhas explained. “Such lack of respect, and the hatred caused by such lack of respect are the country’s greatest danger."